A Slime Digimon with a chubby body similar to silicon, it jiggles flabbily when it crawls forward. 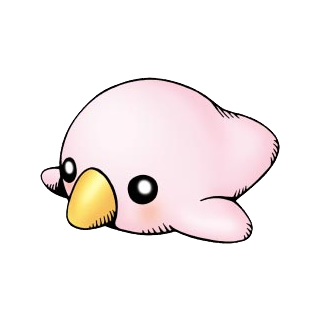 Both of its small fins are unexpectedly handy, but to be absolutely precise it is not yet able to fly. As it loves the smell of the sun, on days with good weather it lies sprawled on the lawn and smells the scent of grass with a sniff, immersing it in a good mood. If it gets in a pinch, it foams out acidic bubbles and covers the opponent in them, then seizes the opportunity to flee. Comes from purupuru which means to shake or shiver. San no Awa  Acid Bubbles 酸の泡 N/A Bubble Blow Shoots bubble-like substances from its mouth. 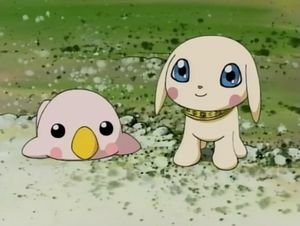 Pururumon (left) and Plotmon from Digimon Adventure 02. 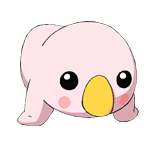 Pururumon is the partner of Inoue Miyako. 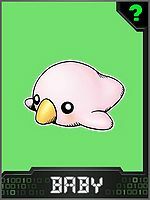 Pururumon is available as a Digimon Medal. This page was last modified on 13 March 2019, at 22:51.